I think the most prominent factor is that I simply had a bad day. This isn't the first time I've had a race that started out feeling bad and just got worse as I pushed along. It was in fact the 4th in the 40 or so races I've run in the past 5 years. We all have days when we just don't have it. The reason we try to sleep a lot, eat well, and rest before a race is that we try to minimize this chance of having one of these days on race day. And minimize we can, but eliminate we can not. Anyone who runs enough races will have a bad day on race day sooner or later. The next most likely factor is that the head/chest cold that I had the week before the race was still lingering enough to slow me down. I thought I had kicked it a full week before the race but then on Monday of race week it came back pretty hard for one day. The rest of the week I felt better and better each day, but certainly I was still congested on Saturday. I've done 5 or 6 races in the past few years in which I was just getting over a cold in the days leading up to the race. A few times I've been able to get through this without it having too much of an effect (NF Endurance Challenge 2009 and Run Rabbit Run 2010) and a few other times (Miwok 2009 and Bandera this year) it's had a definite negative effect on my performance. I do think this illness had an effect on me this past weekend, but it certainly wasn't the entire problem, and probably wouldn't have been insurmountable had it been the only problem. In reading this it might sound like I get sick all the time, but I feel like I get sick about the same as most people (usually 2 or 3 colds a year), I just happen to race about once every 4 or 5 weeks so pretty much anytime I get a cold it is still lingering a little bit by the time I do my next race. I think another reason why it might seem like I get sick all the time to folks who follow my racing is because I'm entirely open and honest to people who ask me how I'm feeling about a race. If I say I've been sick that means I've been sick. If I say I've been feeling really good that means I've been feeling really good. If I've been feeling like crap and someone asks me how I'm feeling I will tell them that I've been feeling like crap. If I'm feeling like crap during a race and another runner asks me how I'm feeling I will tell them that I'm feeling like crap. I'm not interested in playing mind games and trying to hide what I'm feeling. If this openness sometimes works to the advantage of other runners by boosting their confidence (as I think it probably did for Dave during Bandera when I told him how bad I was feeling) than so be it. To me competition is about the collective experience much more than it is about trying to win at all costs. If I tell someone I'm feeling horrible and they gain some energy/confidence from that knowledge then I think that's awesome for them. If I'm able to turn things around and feel better later on then we get a snowball effect going on and can push collectively well beyond what anyone of us could of as individuals. A desire to win is one of the reasons I love to compete with other runners, but it is certainly not the main reason. Winning is instead just really sweet "icing on the cake" of the competitive experience. Anyhow, I'm off on a long tangent here. The point is I was recovering from a cold this week and that certainly didn't help much with my performance ability on Saturday. The third factor that may have been involved in this race is that I was perhaps overtrained/undertapered. My training/taper was in fact not much different with this race than it has been for most of the races I've done in the past few years. I ran a total of 19 miles in the 5 days before this race. I ran a total of 96 miles in the two weeks before the race. If anything these numbers are a bit lower than my typical lead up to a big race. In terms of the longer picture I have run almost exactly the same total mileage, time, and elevation to date this year as I did to this point last year. I have also raced almost exactly the same mileage as last year (260 to date this year and 230 to this point last year). I am however open to the possibility that I have been overtraining a bit and that I need a bit of a break (and I plan to monitor this very closely in the next few weeks). I have had a lot of runs in the past month in which I have felt kind of crappy like I did this past weekend. This isn't unusual though. I often feel kind of weak during my lead up to big races and then when I cut back the mileage for a couple weeks before the race I come around nicely by race day. I didn't do much (in terms of rest) while my body was not feeling very good for the past 4 or 5 weeks because I figured that it would just come around nicely with my taper before the race (as it's usually done in the past). The thing that was different this time around though, and the reason why I might have overtrained a little bit, is that typically when I don't feel well I unconsciously take time off because it's not that enjoyable to run several days in a row not feeling well. This past several weeks though I've been enjoying my running (even when not feeling well) so much that I've just been running through a lot of physically mediocre days and not even really noticing how I'm feeling physically. The 4th, and final factor that may have played a role in all of this is that my body may not have had enough time to adjust to the style of running that I do here in Juneau after spending 8 months in Colorado. I have no doubt that my body responds very well to the type of running (extremely steep and slow going) I do here, but it may be that I need another few weeks before I will have fully readjusted to this. In all likelihood I think what hit me on Saturday was a combination of all of these things. Any one (or maybe two of them) would have been possible to overcome, but the combination of all 4 of these things was just too much. The good thing is that two of these things are already gone (the bad day and the cold); another one will automatically be addressed with the rest which I need to recover from the 56 miles I ran Saturday (and some careful monitoring of my body once I do start running again); and the last one will simply work itself out with time as I readjust more and more to running these incredible trails here in Juneau. In other words I fully plan/expect to be in the best shape of my life in 2 months for UTMB, and despite things not going so well this weekend I feel like I'm in perfect position to move in that direction with a ton of momentum and determination. Things started out feeling "off" for me at Western States this year, and from there it just kept going downhill. My legs felt weak right off the start and my heart rate and rate of breathing were elevated way above normal. My stomach felt a little off as well. Nonetheless, I had a lot of fun running through the snow that covered most of the course from about mile 3 to mile 13, but once we got back on dry ground my legs felt like I had already run 50 or 60 miles - not a good place to be at mile 13. I tried easing back a bit, but felt even a bit worse when I ran slower. No one was pushing a very aggresive pace at this point so I was able to stay somewhat near the leaders despite how weak I was feeling. I tried my best for a few hours to stay close enough to still be in position to take a shot at the leaders later in the race if I could turn things around, but finally at about mile 35 I decided to ease way off and let go of any hope of racing for the win and just try to figure out a way to finish. Well, after 20 more miles (probably half of which was walking) it was obvious that finishing in the state I was in was going to be a stubborn death march that I just wasn't willing or interested in taking part in. I eventually pulled the plug at mile 56. Even with only 35 miles of hard running my legs feel as fatigued and sore today as they usually do after running a full 100. I am of course a bit upset to have had such a tough race, but I had several hours out on the trail yesterday to come to terms with this one and begin to focus on the things I could take away from this that will make me a stronger runner in the future. I got to run with some great folks and then see most of them finish in Auburn several hours later. It was far from how I envisioned my day going, but it was still a great thing to be a part of. Huge congratulations to Kilian and Ellie. They both had amazing races. Kilian showed amazing persistence and just kept plugging along at a decent clip all day. Mike, Nick, and Jez made him really work for his win and each ran amazing races themselves. Ellie's performance is still too unbelievable for me to put into words, but I'll try anyway. Ellie was 15 minutes behind with only 10 miles to go in the race! And she ended up winning by over 20 minutes! This after she was more than 30 minutes behind the women's leader when she left Michigan Bluff at mile 56. When the dust had settled she was across the finish line with the second fastest women's time in the history of the race. I couldn't help but think about how similar her race was to my race last year, but in reality what she did yesterday made what I did last year seem like no big deal in comparison. The amount of time that she made up on the leaders in the second half of the race was more than double what I did last year. Good stuff. Good luck to everyone running Western States on Saturday. Thanks to everyone who is helping out with the race. Thanks to everyone for all the well wishes. Should be a fun one. Doesn't look like it's going to be too awfully hot, maybe even a few degrees cooler than last year. Should only be around 90 in the hot areas of the course. Either way though this is about 20 degrees warmer than any weather I've been in all year. It's going to feel really damn hot for sure. Did about 5 or 6 miles in Truckee a bit ago. It was about 70 or 75 and this felt really hot. For me it won't even be the heat as much as the dryness. I've been working through a head/chest cold for the past week and the dry air (combined with the altitude) really puts some extra stress on the lungs. Should be good and ready to roll by Saturday though. Now that Western States will be my next run I'm starting to build some focus and excitement about Saturday. It's going to be really exciting to run a 100 mile race with such depth of world class runners (and then another one again in August). All of the 100 milers I've done previous to this one had significantly fewer truly top level runners. Even Western States last year was nowhere near as deep at the top as this year. It'll be fun to see how it all shakes out. Hope you all enjoy your weekend as much as I'm hoping to. Here's a link to a video that Joel Wolpert put together that is now featured on The Running Times website. Joel does a great job of not making things too complicated in the making of his films. His film making style actually reminds me a lot of my running style. The finished product comes as close to showing who I am as a runner than anything I've seen or read previously. Somehow Western States has crept up to only 6 days from now! When did that happen? Seriously, the amount of time I've spent thinking about this race so far this year compared to last year has been almost nothing. Not sure if this is a good thing, a bad thing, or simply just a different year/different thing. It's been over two years now since I last trained with any serious structure (except for the structure that is a lack of structure), but this Spring has really evolved to a new level for me in this regard. In the past couple years as big races approached I did find myself focusing a little bit on peak training periods, high mileage runs, and specific tapers. Maybe I'll return to more of that again in the future, but so far I just haven't really done any of this in preparation for next week's race. Instead, I've just been running day to day more than I ever have. Even now, with the race at the end of this week I find myself thinking more about what run I'm going to do tomorrow than the run this coming weekend. This might sound like a careless and crazy approach to such a highly contested race, but I've had more fun than ever "training" for this race, and the more the line seems to blur between training and racing the more I seem to enjoy all of it, and the better my races seem to get from a performance standpoint. At some point thus the question becomes: why race at all then? I'm still not to the point of seriously asking myself this question. I still get a lot of satisfaction from competing with others at something we've all put so much time and effort into. 29 days out of 30 I prefer to just be out running through the mountains at a mellow pace, exploring the terrain around me, but about once a month it's really fun to line up and push myself physically and mentally in conjunction with and in competition with dozens (sometimes hundreds) of other like minded folks. I imagine that I will eventually get to the point of not craving this kind of running anymore, or at least much less often than the once a month that I do now. For now though, come race day, I'm as focused and ready as anyone to scratch and claw to compete at my highest potential on that given day. I'm just not willing to compromise my enjoyment and nourishment from my running on the other 29 days of the month. I did that for a couple years in the past and there's just no comparison in terms of the nourishment that I get out of it. Training with a specific focus and purpose of trying to be as fast as possible on a given day at some point in the future feels so shallow and silly to me when compared to simply going out and doing the run that feels the most logical, enjoyable, and appealing on each given day. So for now I'm thinking mostly about the Juneau ridge run that I'm probably going to do tomorrow morning, but come Saturday morning all of my focus will be turned to running from Squaw Valley to Auburn as fast as possible. And with the field showing up this year it's going to have to be really damn fast to have a chance of being anywhere near the front of the pack. 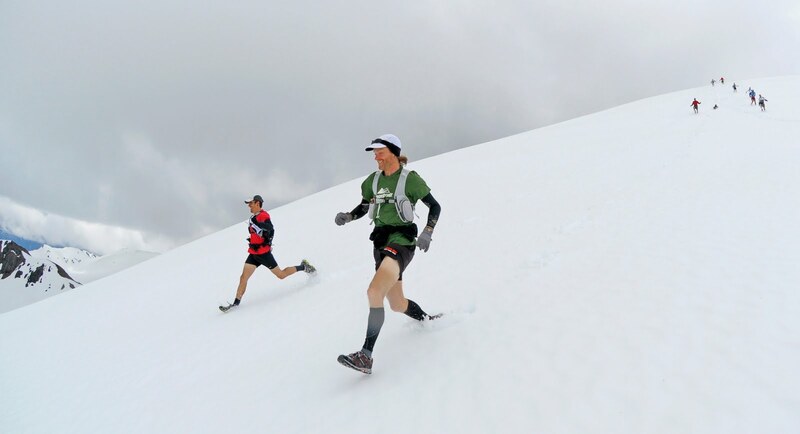 The first ever Alaska Mountain Ultrarunning Camp is now in the books. I've had the idea for this camp in my mind for 2 or 3 years and finally decided this year to make it happen. It has been a lot of work to put it all together and get it off the ground, but the reward that was the first session of this camp made all of the work completely worth it. We had an amazing group of runners gather for 5 days of running here in Juneau. The group dynamic was amazing and I feel like everyone came in with a really open mind and learned some key aspects of running. I've always been a big fan of showing people what to do as opposed to telling them what to do. At this camp I didn't want to do a lot of lecturing to people about how they should run, but rather I wanted to just go out and show them how I run and what has worked for me and see if they can learn anything from that. I think on the first day most of the "campers" might have thought I was a bit crazy, but by the middle of the week I started to see everyone beginning to find a real comfort and understanding with what we were doing. When the camp was over I realized that I too had learned a lot about life and about running. I thought this was going to be a lot of hard work and probably quite frustrating at times, but aside from the work of getting everything prepared ahead of time, the actual time during the camp was one of the most enjoyable and worthwhile weeks of my life. I can't wait to do it again next month. Thanks so much to those of you that attended this first camp. I have so much gratitude for each and every one of you. For those interested in seeing some great photos and videos from the camp please be sure to keep and eye on the camp website in the next few weeks as I will be putting some stuff up there very soon. You can find this website HERE. Click here for a little video from day one of the first ever Alaska Mountain Ultrarunning Camp. I can't begin to describe how incredible and satisfying this camp was. Watch this above video to get a taste for yourself. One of the best weeks of my life! Many more pictures, videos, and thoughts to come, but for now I need to go catch up on sleep cause I'm pretty sure I've spent more time running than I have sleeping in the past 5 days. Haven't been taking the time to post much here. Too much good running to be spending much time online. Also been busy with last minute details for my running camp which begins tomorrow. If anyone is interested in an Alaskan running vacation later this summer there is still one space remaining in the second camp session that begins on July 28th. Check it out here. Hope you're all getting out and enjoying the mountains as much as I've been in the past week. about 40k of vertical in the last 7 days. Doesn't get much better than that.